I'm sure any dedicated Twilight fan would know this, but the DVD is available for pre-sale at Amazon.com for $22.99! It will be released March 21, 2009 (way too far away!). I actually pre-ordered two (I know, I am obsessed), but I figured I wanted one here and one at home. Also, on the topic of Twilight, Dakota Fanning was offered the role of Jane. How are people feeling about that? At first, I have to admit, I was upset, mostly because I don't really enjoy watching her. The more I think about it though I think she will do a good job. She is young, but whatever. New Obsession - Nap Blankets! 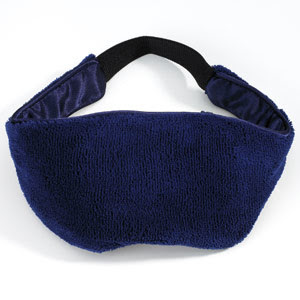 My nap cuddle blanket and eyemask from Brookstone. Really am I 5 years old? Apparently. The thing is, all my housemates has this lovely little nap blanket, and so for Christmas I asked for one. It is 45 dollars at www.brookstone.com (I got the pink one) and it is seriously the softest thing ever! Its great to cuddle with at night (move over, goose the moose) and makes me feel like a little kid again. I also use the nap eyemask which is $20 an d filled with a gel mask you can put in the fridge (of course I've never done that...too lazy)! Random, yes, but I thought I would share! These two things and my Nyquil is the only thing getting me through this cold/flu/bronchitis/whatever I have. It is SUPER cute in person - a girl in my sorority has it and it is love. 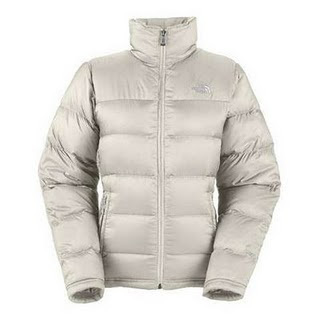 It is the northface W. Siren Jacket in Vintage White. The problem is, I kinda want a jacket that has a hood? So now I am confused, because I love this one, but a hood might be necessary in this weather. I can't afford to get two! Of course, I could always pair this with my favorite earmuffs! So what do you guys think? This jacket, or go for a similar one with a hood? Oh and I wanted to tell people - I am bad at responding to comments on here, but I do read them all. If anyone has an important question, just e-mail me. I get about 300 emails a day (I get one for every subscriber and every comment) so if I don't see it, I'm sorry, but I do try! Have a good night lovelies! so i have been MIA from my blog, AGAIN, for awhile. My excuse is that I have been really busy with my "real" life lol, but I love that I have an escape. Makeup, essentially, is my escape for now. Right now it is 1:30 am, and I am watching Twilight (what else right? this is elle, after all). My nights (when I don't go out) consist of watching twilight, reading twilight, or talking to haley (haleybean on youtube) and kimmy (wubearkitten on youtube) about twilight. But really guys, that is where I have been. I have a ton of exciting things coming up. I never know how many videos is too many. Sometimes I go a week where I only have time to put up one video, but some weeks I wanna put up two a day. But then I feel like people don't see my old ones, they only see the one just posted. So if I post two in one day, they only see the newer one. OMG I am rambling... The whole point of all that was I have 2 vids that need to go up soon, but I dont wanna post them an hour apart. I think I am thinking too far into it. Maybe I should go to bed. Most of the reasons I don't update this more is that I have nothing to say. Right now I have nothing to say, but I have written quite a bit. Funny how that is, eh? I bought stuff from the Brunette Blonde Redhead collection! Expect a haul ASAP. I already feel like I missed the boat with that collection. Like I am too late ya know? hahahahaha... that wouldn't even make sense to a normal person. Hey everyone! Today I went on a depotting spree and organized my mac palettes! Hope you enjoy!